I read a neat story about Franz Schubert (1797–1828), the Viennese composer who wrote more than 600 songs, plus much chamber and orchestral music during his way-too-short lifespan. Schubert is one of my personal favorites. One day, however, when his friend the German composer and conductor, Franz Lachner came calling unexpectedly, Schubert was not in the mood for work. 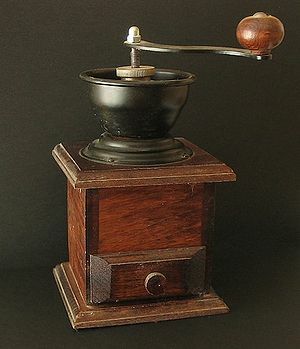 He suggested to Lachner, “Let’s have some coffee.” Schubert then hauled out his most prized possession, an old coffee mill. He carefully measured the coffee beans, then took off his glasses and started grinding. Within moments, Schubert exclaimed, “I’ve got it! I’ve got it! You rusty little machine!” He threw the coffee mill into the corner, sending the beans flying. “What have you got?” asked Lachner. “This coffee mill is a wonderful thing,” explained Schubert excitedly. “Melodies and themes come flying in. You see, it’s the ra-ra-ra, that’s what! You search for days for an idea, and the little machine finds it in a second!” And, he began singing the themes of what would become the String Quartet in D minor, Death and the Maiden, which Lachner faithfully wrote down. Apparently, even Schubert benefitted from the occasional change in his morning routine. This little story is an excellent example of how some of our best ideas can come from the most unlikely places. I saw the new Jobs biopic over the weekend. Whether it was an accurate portrayal of Steve Jobs and the early days of Apple Computer or not, I have to say, I enjoyed it. Rather than merely taking in the story itself, I challenged myself to notice the details. Surely an important detail was the eye-catchingly simple, yet creative, typeface treatment used in the film titles. Film title design is an art unto itself and Jobs did not fall short here. I’d like to view those titles again. Another detail that was impossible to ignore was the soundtrack. As a musician myself, music tends to play a major role in any film I view. The Steves spar once or twice in the film about their own personal music preferences. 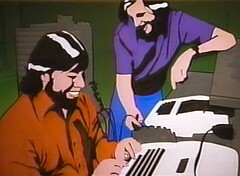 Jobs was a Dylan fan; Woz favored the Beatles. What stood out for me, though, was the inclusion of Bach in the soundtrack, specifically, the final allegro movement from Bach’s 3rd Brandenburg Concerto. The movement was used as an effective aural backdrop to depict Steve’s enlightenment period after he had dropped out of Reed College. I felt that the film did a good job of depicting how Steve and one of his college friends had taken some time away to visit India in search of spiritual (and other) enlightenment. These scenes were fast-paced and even a bit hazy. The Bach was performed at a breakneck tempo. It might as well have been notated vivace. And, it worked for me. Knowing that Bach’s six Brandenburg Concerti were composed in what was probably the happiest and most productive period in Bach’s life, around 1721, I naturally assumed that those months in India represented some of Steve Jobs’ happiest and most productive moments as well. What details did you notice in the film?